In 2002 I was part of a Maestras (Female Print Master) Atelier called “Upraise of the Urban Goddess”, curated by Diane Gamboa. These series of women master-printers (founded in 1983) includes many illustrious artists, themes and prints. One day there will be an exhibit of these prints, maybe at LACMA (the Los Angeles County Museum of Art), because they have suites of every print in this series in their archive. For “Upraise of the Urban Goddess”, Diane gave us readings from Anais Nin, Diane Arbus, a photo essay from French Vogue called Santa Maria de los Chicanos by Peter Sellars , an essay on Great Goddesses (Chamunda, Kali, Coatlicue, Laussel, Wilendorf), an article on an 80 year-old woman coping with mental illness in the Los Angeles County jail, the Autobiography of Bette Davis, Home Remedies from Mexico, excerpts from Carlos Fuentes book The Goddess who hunts alone and “A Novice Woman’s Quick Reference Guide to Erotically Dominating a Submissive Man” for our inspiration. My print Knowingly Walking Through the Imaginary River Towards Divine Destiny, is about self guidance with help from ritual and intuition–as one travels in a world that is not always what it appears to be. “Delgadillo discusses in her print an experience of female intuitiveness and a universality of spirituality, ultimately a meditation for healing. The central image strikingly reveals the flesh-ness of the woman. She is composed of colors that resemble the palettes of biological, anatomical drawings. These colors also draw the eye over the entirety of the body, introducing the details of her face and neck, while slowly down the gaze at her torso and legs, as well as her arms which extend outwards in a gesture of embrace and balance. The candle and the Tarot card in the woman’s hands are gently wielded as offerings to the viewer, yet also to the city in the background. Delgadillo’s image is very much about the physical locale of the city. As LA moor where the city figures prominently as a character in the narrative, Delgadillo introduces cityscape as an element of the goddess. Yet, over the other shoulder of the woman, we glimpse a row of five hearts on the horizon. These hearts seem to address the notion of growth and hope for the city and inhabitants, much unlike a noir metropolis. The hearts and the city are un-trusive to the central image, but are powerful enough details to complete the characteristics of the goddess image and remind the viewer of the urban situation of contemporary spirituality. Crowned by the sun, or moon, the woman looms forward. She is grounded in the element of water, energizing her with strength and the curative possibilities of woman and water. The green haze of the sky and pink clouds offer a dreamscape setting, but also call to mind the element of air and smog of LA skies. The speckled mid-layer of the print creates energy and movement, perhaps of the city and perhaps also of the figure herself. 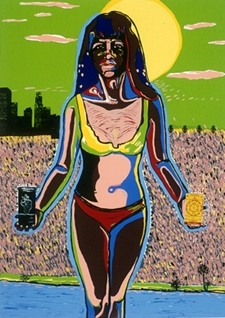 It is this energy and movement that the feminine force in Delgadillo’s print calls forth. Speaking to the universality, both of body and of time, the woman’s image conjures notions of the ever present-ness of the female as a source of wisdom and intuition.